"In my time I have seen men who have come to their death by violence, but I have never seen such an extraordinary sight as he presented. It was as if some savage thing, fastening upon him, had torn him to pieces with tooth and nail. His flesh had been ripped and rent so that not one recognisable feature was left. Indeed, it might not have been a man we were looking upon, but some thing of horror." After a night of intemperate drinking and gambling with his neighbour Edwin Lawrence, John Ferguson awakens in a cold sweat from a horrible nightmare in which he seemed to see Lawrence being torn to shreds by some vicious beast. But what is Ferguson's horror when he wakes to find that a beautiful woman, covered in blood and with no memory, has climbed through his window and that his vision of Lawrence's death is all too true! Who is the killer? The list of suspects is long: Ferguson, the lovely amnesiac, the dead man's dissolute brother. Or maybe the truth is more terrible still: Was Lawrence slain by the supernatural creature of Ferguson's dream - a bloodthirsty demon capable of the most savage of murders? 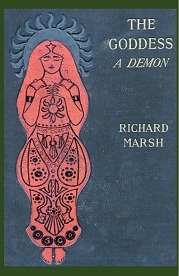 One of eight books published by the prolific Marsh at the height of his popularity in 1900, The Goddess: A Demon retains its ability to thrill and terrify. This new edition, the first in over 75 years, features the unabridged text of the first edition and includes a new introduction and notes by Minna Vuohelainen as well as a wealth of contextual appendices and a reproduction of the original cover.